The Books for Walls Project: Library Thursday: Show Your Card! 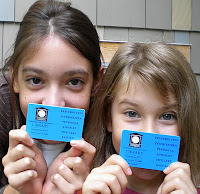 Library Thursday: Show Your Card! September is Library Card Sign Up Month and @yourlibrary has invited library card lovers to show your library card... The Sisters posted theirs this morning on click here to add yours. They have a fun slide show of all the photos, just scroll down on their website to watch it! Take a moment to tell us about your favorite library and we'll add them to our ever growing Favorite Libraries List --make sure the library you love is on it! Happy Reading and don't forget to participate in this weeks challenge, its a fun one! What a couple of cute bibliophiles you've got there Books for Walls!!! !